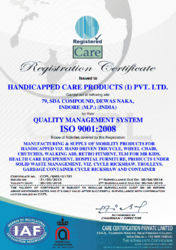 Established in the year 1980, we, HHW CARE PRODUCTS I Private Limited , are one of the glorious ISO 9001:2008 certified manufacturers, suppliers, wholesalers and retailers of a gigantic series of Mobility Products. Our major product series comprises of Side Wheel Attachment for Activa, Regular Tricycles, Maharaj Vihar Wheel Chairs, Sports Wheel Chairs, Bajaj Platina Motorcycles, Advertisement Tricycles, Winner Cycle Exercisers and Battery Operated in Wheel Chairs that are manufactured with the assistance of latest and advance technology, in order to facilitate maximum comfort. Owing to the ease of usage, tough construction, longer functional life, supreme comfort, low maintenance and excellent corrosion resistance, the proffered range is vastly used in hospitals, clinics and other sectors as well. We have established a state-of-the-art infrastructure facility that is set up with basic amenities, machines & tools that are based on the cutting-edge technology, in the market. Furthermore, we have recruited a team of proficient members, who are experienced and qualified to understand & cater to the exact requirements of our prestigious purchasers. We lay huge emphasis on the quality of the proffered range, which can be availed in customized specifications as well. In the past years of our service, we have earned a vast list of customers that includes Social Justice Department of various States, Senior Cycles, Hubli, Chamatkar Agencies and Harbans Cycle, Pune. Under the incomparable leadership of Mr. Navin Batra and Dinesh Batra, we have gained a strong position in the business. It is for the constant guidance and motivation of the mentors, that we have reached the peak of success and recognition in the field. Engaged in manufacturing mobility aids, we are also growing with the mission to make the lives of the physically challenged people easier. We are aimed at making them independent and self reliant through providing aids that help in moving or commuting. (IOBRD) Indian Organization for Business Research and Development has given its prestigious award for the “individual contribution for Nation’s Development” to MR. Laxman Ramchandra Batra Chairman of Handicapped Care Products (I) Pvt. 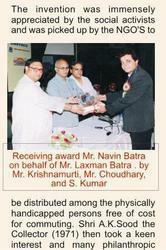 Ltd receipt the award by Navin Batra ( Director of the Co.) on behalf. This is one of the most prestigious awards in India for nation development. It was given at a glittering ceremony in Delhi on 25th May 2006 by Shri G.V.G Krishnamurti the the ax Former Election commissioner of India., Mr. Dhirendra Pratap Choudhary the Minister Utranchal Pradesh and Mr. S. Kumar the General Secretary of IOBRD. Spacious and well-equipped infrastructure has played a vital role in our success. Our infrastructure is efficiently equipped with latest machine and is well-segregated into varied departments, so that efficient production is carried out. We have designed our infrastructure on modern lines and each process is carried out here systematically. Our infrastructure has enabled us to fulfill the demands of clients in an appropriate manner. We carry out researches on regular basis, so that better and improvised range is delivered o the clients. Our skilled R & D professionals keep close eye on the changes taking place in industry and make sure that the best range is delivered by us. They use advanced technologies and techniques in manufacturing of our range so that clients are served in an efficient manner. Dinesh Industrial Corporation is to provide mobility aid/product to ensure that people with disabilities, victims of war or natural disasters and people affected by disease are get best beyond expectation mobility to fulfill their dreams to fly. To avail the ergonomic and economically designed mobility products for PWD to become active with zeal. We are leading the industry by serving our clients in an appropriate manner, with the products of premium quality. Our products stand high in terms of quality and can be availed at reasonable prices. Our range comply with the prescribed quality standards. Support of highly skilled and dedicated staff has made our tasks easy and has enabled us to remain a step ahead in industry. They are aware of the trends prevailing in the market and perform the tasks in coordination with each other so that positive results are derived. Training sessions are organized by us after regular intervals, so that our team can remain aware of the latest market trends. As we aim at serving the handicapped people with our products, so our entire range is designed keeping their ease in mind. We aim at providing them maximum comfort. We customize our range as per the clients demands, hence we are getting orders from various NGO’s, state and central government organizations. As Social Justice Department, Sarva Shiksha Abhiyan, Municipal Corporation, Health Department are growing at rapid rate, we are serving their purposes worldwide. We have carved a niche in industry by serving the customers in most desirable manner. Our products are delivered in the market in timely manner and as per the customer’s demands.